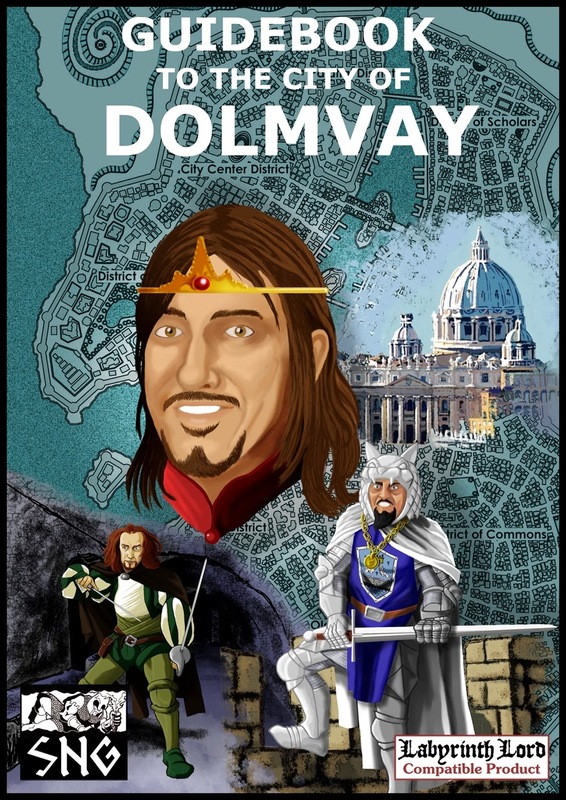 Guidebook to the City of Dolmvay. I have been waiting for this book for a while and I have to say it was worth the wait. Dolmvay is not only a highly detailed city complete with maps, npcs, new monsters and pretty much everything you need, it is also a shared city. Let's talk about the product first. It's Pay What You Want, but it is certainly worth at least $19.95 or more (so pay at least 5 buck or more!). You get 223 pages worth of material. There are the maps I mentioned, but there is also a fairly detailed history. You could easily drop this into any game, and let's be honest, any system. If you are familiar with other products from SNG then takes place in the World of Amherth setting. But this book (and most of the Amherth books) are easily adapted to any setting. There is a chapter on adventuring in the city. How the local churches react to magic and what can be expected of travelling adventurers. Makes it perfect for a way point between adventures, but you would be missing all the fun. The book also details an number houses, factions and NPCs and their own desires for the city. If you like games of political intrigue and courtly drama then this is a good place to start. The bulk of the book details the layout of the city. In this respect it reads like a guide book. NPCs, hooks and other information is given. There is plenty here for new GM to use it as is and plenty more for an experienced GM to add their own information. It strikes a nice balance between detail and flexibility. Among my favorite items are the random rumor table and the common greetings and gestures. Things like this give a setting life of it's own. Common businesses are covered as well as a sampling of Taverns and Inns. City encounters and even some new monsters. Venture into the sewers or the Island of Heroes. There is a section on random NPC generation as well. Dolmvay the concept is the idea that this is a shared City. If developers want to create their own encounters, adventures or anything else really and set it in Dolmvay then there is an easy to use and free license to do so. It is such a great idea I am surprised that no one else has done it before. This book is steal at any price. I think I will need to come up with some sort of witch coven that is active here. That would be fun. It would have to be small and of course persecuted by the local church. I also enjoyed this! It flowed well and had a nice combination of fluff and meat. Other than that well worth a few bucks! yeah after I got I regretted not paying more. Hey Timothy - thanks for the review! The Guidebook to the Duchy of Valnwall will be my next Kickstarter project so the area will be well detailed! Also, a witch's coven would be great. Did you see the writeup for the chalek?